Would like to delete the bolt catch release, as is inop on the cmm conversion and pruning grams where can. Haven’t found a filler thru google; any suggestion? In interim, may chop one up in garage and see how it goes (leaving button, removing interior portion). Would like to delete the bolt catch release, as is inop on the cmm conversion and pruning grams where can. If you are trimming grams, why are you adding a filler? If your wanting to fill the void by removing the bolt catch I’d use black silicone/RTV for automotive applications. This material can take the heat plus could be removed later if you wanted to install the bolt catch. This type of silicone has been used to make gaskets for valve covers so should work. I’ve never had an issue leaving the bolt catch in place with dedicated uppers and conversion kits. Any weight reduction would be minimal plus with my current lowers if I need to I can swap a rimfire to centerfire upper by pushing to captured pins. Ahhh, think will try the catch-22. Thanks! Says works with cmmg conversion. It was the lack of function that made it worthless weight to me - it’s my steel challeng gun, and while it’ll never be custom 10/22 fast in transition, it’s getting closer. Ahhh, think will try the catch-22. You can omit the bolt catch spring and detent, and the Catch-22 still works. It may work even better that way. My bolt catches have a spring but no detent. Were you referring to the recoil spring and detent? The older I get,the better I used to be. Detent is the wrong word. DPMS calls it a buffer, the post on the left in the image below. I have a lower in which the catch-22 works more authoritatively on the last round with the spring and buffer omitted. I swap a Seekins 300 blkout upper out with my cmmg .22 dedicated upper which live on my Seekins lower depending on what I feel like shooting. The .22 bolt locks back on my Black Dog mags follower. When I remove the mag it goes forward. Works fine. The bolt catch is only used for the 300 blkout. Didn’t know someone made a 22 bolt catch. I wouldn’t need one for my setup. When I remove the mag it goes forward. Works fine. The bolt catch is only used for the 300 blkout. Didn’t know someone made a 22 bolt catch. I wouldn’t need one for my setup. The Catch-22 operates the same way the catch on an AR in 5.56 does, so after a magazine change one hits the bolt release rather than operate the charge handle. It does require S&W 15-22 magazines which in turn require accommodation of their slightly smaller size. I have a CMMG magazine. I find it tough to load the last few rounds, in part because it lacks a follower button, Also, it's the size of a 30 round magazine, which I don't need. I can sling up and get into position with a short magazine that never gets in the way, and hit the bolt release. I don't need to carry any sort of reloader because of the follower button. Some people use the Catch-22 with Black Dog magazines just so they can keep the bolt locked open at ranges that require an open bolt. Some use S&W magazines and don't bother with a bolt hold open device just because they like the magazine better. I find the advantges of the catch-22 (or Better Mag Adapter) and 10 round short S&W magazines to accumulate into a better system overall. Last edited by zukiphile; 03-25-2019 at 09:09 AM. If you don't mind the bolt holding open on the follower that's fine. If you want BHO capability for mag swaps that is when we look at an adapter. The Catch-22 will dedicate the lower to a 22 upper, the BMA is removable without the use of tools and uses a standard bolt catch. Both of these rely on SW mags. 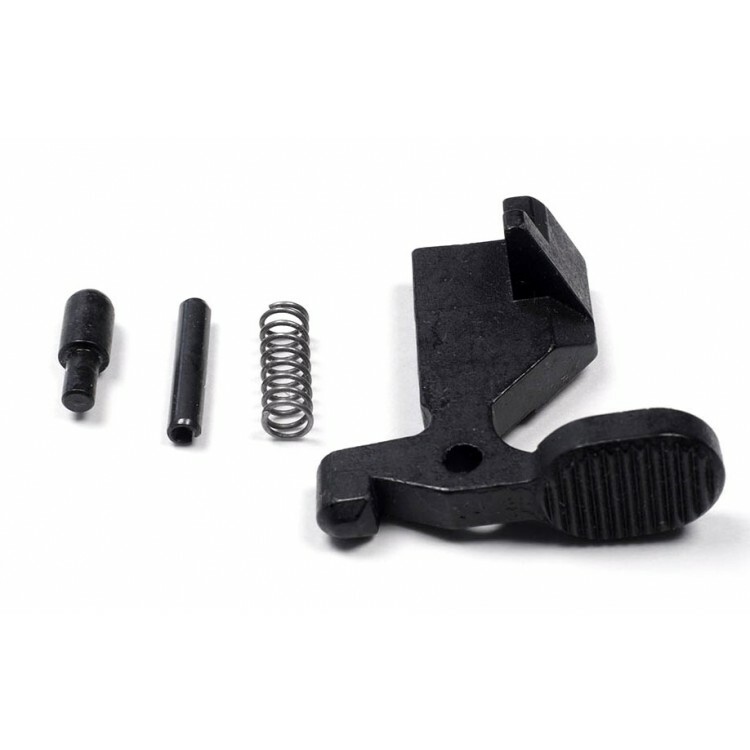 The BMA has an integrated ramp that shims the magwell for the smaller SW mags. The Catch-22 requires either shimming the mags themselves or the magwell. The Catch-22 is more of a committed option than the BMA, in my opinion. Last edited by octanejunkie; 03-25-2019 at 08:33 AM. The BMA II will not work with Chiappa, DPMS and Tactical Solutions.